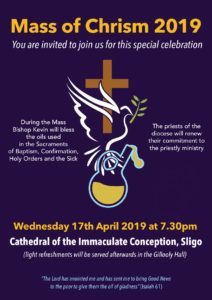 Bishop Kevin invites you to attend the Mass of Chrism on Wednesday 17th April at 7.30pm in the Cathedral of the Immaculate Conception, Sligo. During the Mass, Bishop Kevin will bless and consecrate the oils used in the Sacraments of Baptism, Confirmation, Holy Orders and the Sick. The priests of the diocese will renew their commitment to their priestly ministry. Refreshments afterwards in the Gillooly Hall.